Today’s therapies are vastly improved over the first drugs used to treat HIV, but these advancements continue to come at a cost. The prices of HIV drugs continue to rise every year at an average of 7–9 percent. While in the past this usually hasn’t directly affected someone who has drug coverage through their health insurance plan, increasingly individuals are having to pay co-insurance (a percentage of the cost) on their medications. The good news is that help is out there. ADAPs, several non-profit organizations, and the pharmaceutical companies themselves have assistance programs in place to help you pay for the treatment you need. Most pharmaceutical companies provide some level of assistance through a patient assistance program (PAP) for people who can’t afford certain medications. These PAPs are typically for patients without insurance or are underinsured who don’t qualify for Medicare, Medicaid, or AIDS Drug Assistance Programs (ADAP). Qualifications and criteria vary by program and are based on a percentage of Federal Poverty Level (FPL). Patients or providers should contact the program to see if they are eligible. Many companies also have co-pay assistance programs (CAPs) for those who have drug coverage through privately held insurance. These programs may cover all or part of the drug co-pay, co-insurance, and deductibles up to a specified amount, and typically don’t have any income requirements. Certain restrictions and eligibility requirements apply (for example, recipients of ADAP, Medicare, and Medicaid may not be eligible). Individuals can get the co-pay card directly from their provider, the manufacturer’s website, or by calling a toll-free number. Some programs have a reimbursement process in place if you are required to pay the co-pay out of pocket. Some PAPs and CAPs will make exceptions in an effort to ensure people have access to the medications they need. For example, for a person on ADAP who has insurance but who has a high deductible, a CAP may cover a certain percentage. Be sure to ask for an exception or review if you are at first denied. 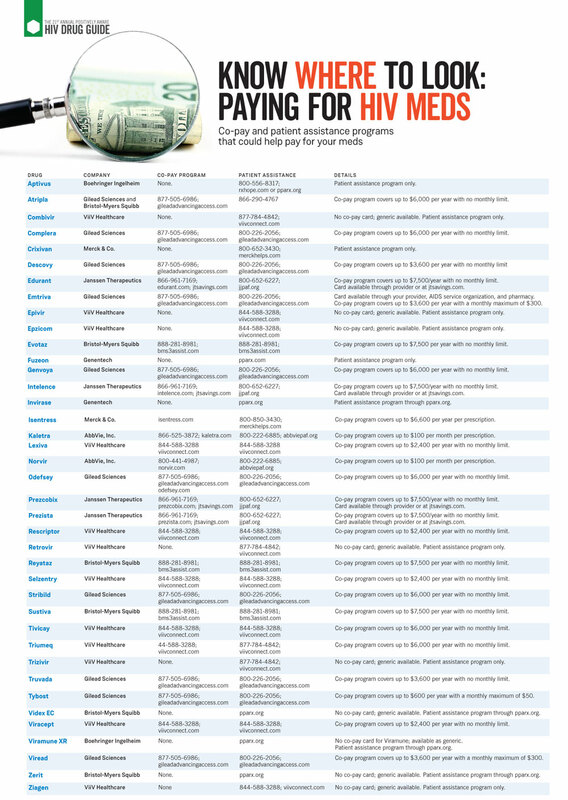 Many state ADAPs can help pay out-of-pocket costs for HIV drugs obtained through some insurance plans. ADAPs can also help pay premiums in some states. Check with your state ADAP to learn what your state offers, as well as the income limits. It is critical to consult a trained enrollment “navigator” when choosing an insurance plan. Contact your local HIV/AIDS service organization for help or a referral. The Affordable Care Act provides for closing the Medicare Part D prescription drug benefit “donut hole” or coverage gap by 2020. Beneficiaries receive a 50% discount on covered brand name drugs while they are in the “donut hole,” with increased savings on prescription drugs while they are in the coverage gap until the gap is fully closed. In addition, ADAP benefits are now considered as contributions toward Medicare Part D’s True Out of Pocket spending limit (“TrOOP”), so ADAP clients who have Medicare Part D should be able to benefit. HarborPath is a non-profit organization that helps uninsured people living with HIV/AIDS and/or hepatitis C to gain access to brand name prescription medication at no cost, by providing case managers with a single online portal for PAP applications and medication fulfillment through a mail-order pharmacy. Go to harborpath.org. The Department of Health and Human Services (DHHS), along with seven pharmaceutical companies, NASTAD (National Alliance of State and Territorial AIDS Directors), and community stakeholders developed a common patient assistance program application that can be used by both providers and patients. To download the form, go to hab.hrsa.gov/patientassistance. Co-pay and patient assistance programs are also available for hepatitis B and C drugs, and medications or treatments used for other HIV-related conditions such as lipodystrophy—some of these are included in the co-pay and PAP charts at right. 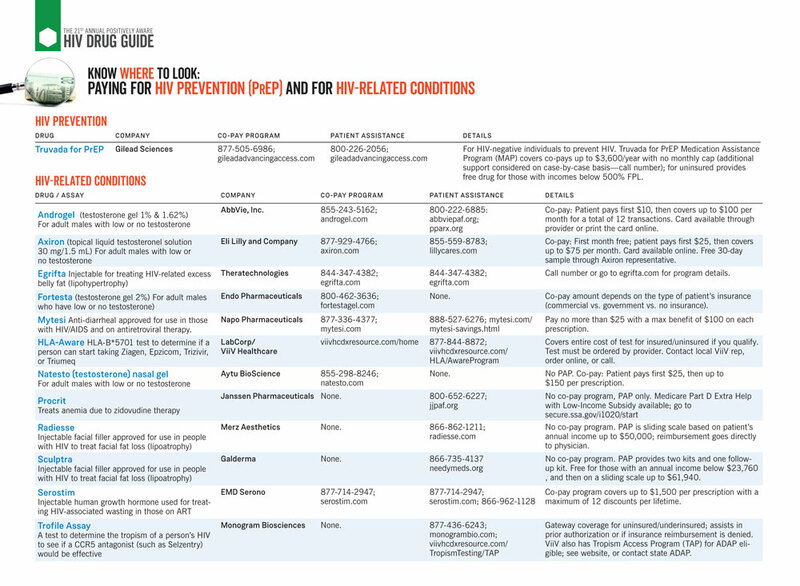 There is even a separate assistance program for Truvada as prevention, or PrEP (pre-exposure prophylaxis). The Patient Assistance Network Foundation expanded eligibility criteria for HIV treatment and prevention (including PEP and PrEP). Those who qualify (you must have insurance and income below 500% FPL) are eligible to receive a grant of up to $7,500 a year to help cover out-of-pocket costs for meds. You may apply for a second grant during your eligibility period depending on available funding. 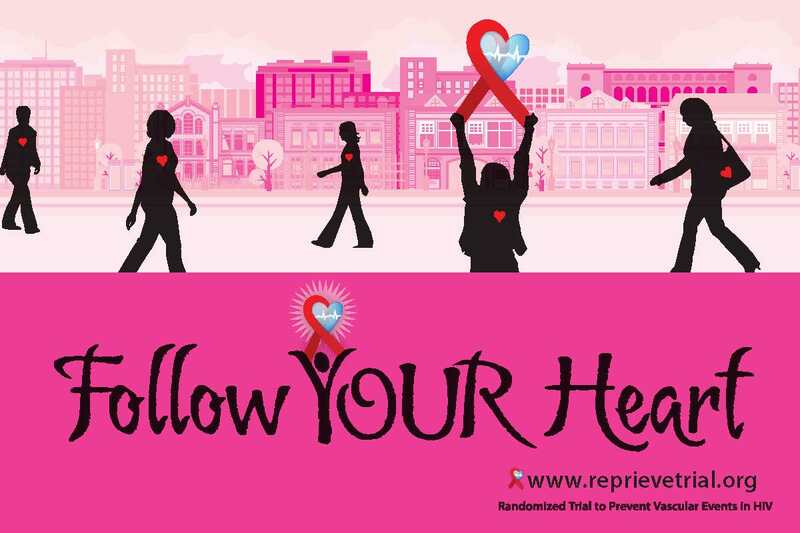 Go to panfoundation.org/hiv-treatment-and-prevention. To learn more about other patient assistance or co-pay programs for drugs used to treat HIV, certain opportunistic infections, or other conditions, talk to your provider, contact the manufacturer directly, or go to pparx.org and needymeds.org. For help in getting many medications not covered by ADAP, including alternative therapies and generics, even if you receive medicines through another discount program, go to SurvivorRxPlan.com. Keeping the lines of communication open between you and your health care provider, pharmacist, and case manager is essential when managing your health, so stay informed. Use the adjacent chart to check specific details. SPECIAL THANKS to Britten Pund, Associate Director of Health Access, NASTAD, for her review of this article; Jason Lancaster for updating the accompanying charts; and the Fair Pricing Coalition (FPC) for some of the information herein. Go to fairpricingcoalition.org or hivhealthreform.org. POSITIVELY AWARE compiles co-pay program and patient assistance information for each drug included in the HIV Drug Guide. View or download the complete, printer-friendly PDF co-pay and patient assistance chart.